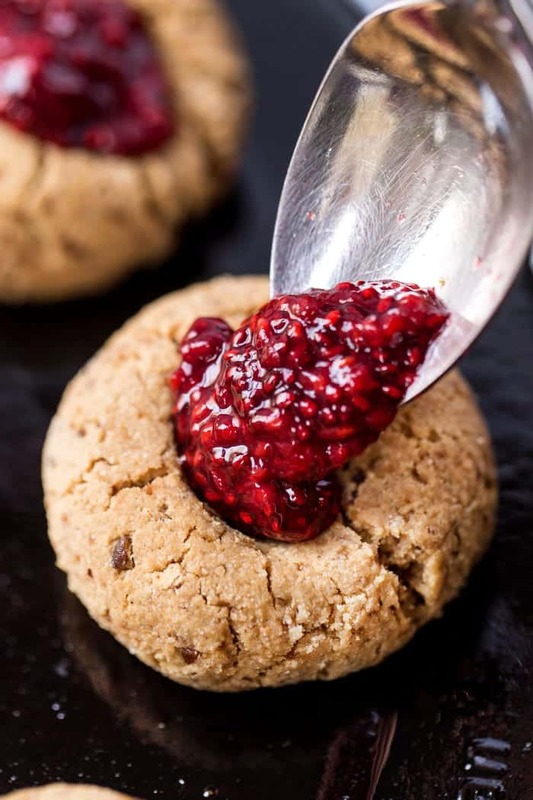 These healthy and Gluten-Free Raspberry Thumbprint Cookies are made with a cashew butter base and topped with homemade raspberry chia seed jam! Day 2 of cookie week! Are you loving it so far? I don't know about you, but there's honestly nothing I'd rather do that bake batch after batch of cookies during the holiday season! 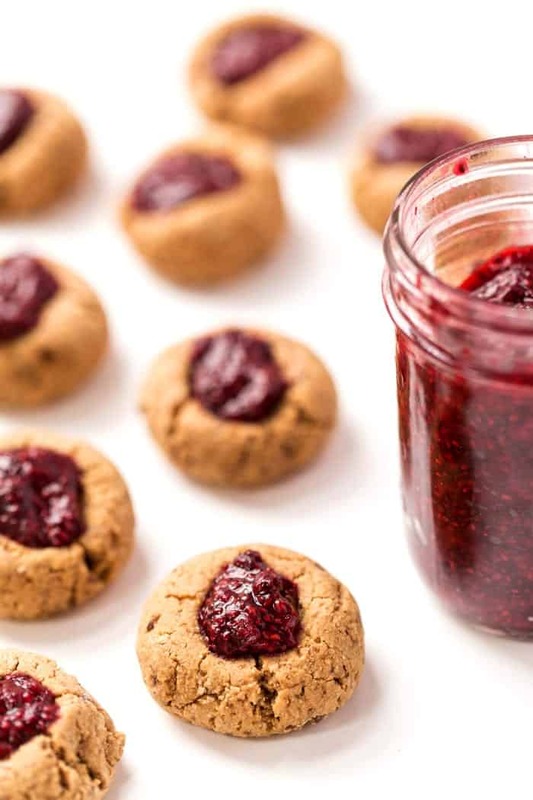 Yesterday we made our vegan sugar cookies and today we're making a batch of gluten-free raspberry thumbprint cookies! And friends, they're incredible. 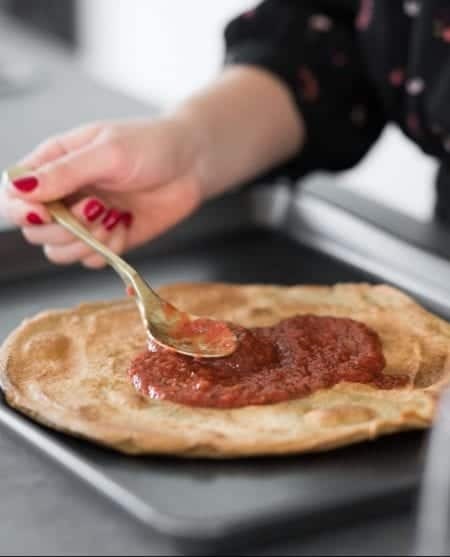 We're making them with a soft and chewy cashew butter cookie base and whipping up our own raspberry chia jam for the center. YES! And they are super duper easy to make. You just have to beat together the cashew butter with a flax egg and some maple syrup, add in your flour, baking soda and salt, roll 'em up into balls and your cookie base is done! 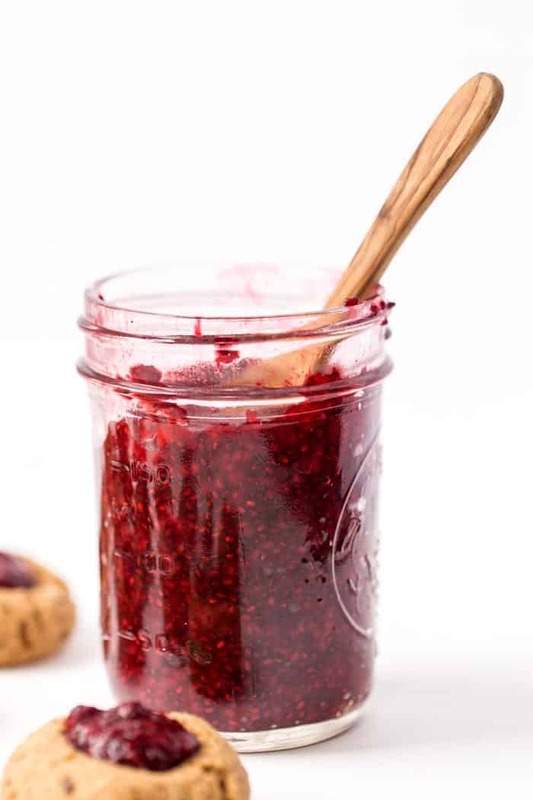 The homemade raspberry chia jam? Equally as simple. 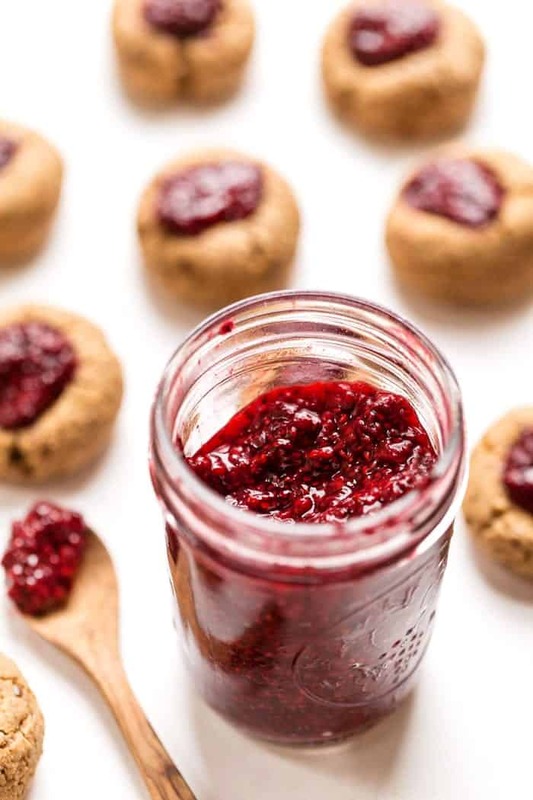 If you've never made chia jam before, get ready because this stuff will knock your socks off. We only need 3 ingredients (plus optional vanilla) and zero refined sugar! 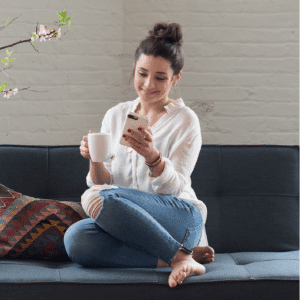 That's right, it's time to say goodbye to that insanely sugary filled jam from the supermarket and welcome this high protein, low sugar jam into your life. 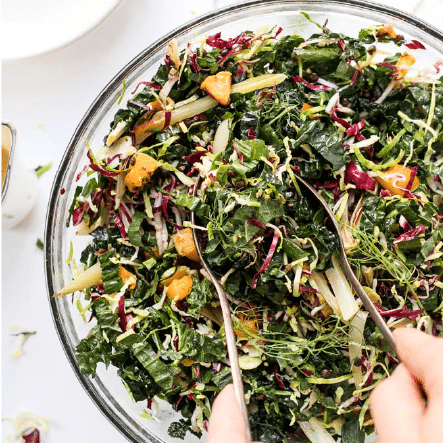 But what I really love about this recipe is that it's customizable for what you like. Sensitive to cashews? Swap out another nut/seed butter. Don't like raspberry? It would be delicious with strawberries, blueberries or even peaches during the summer time! 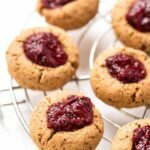 For now, we're sticking with raspberry because it's the perfect compliment to these cookies and makes for one festive holiday treat! Preaheat the oven to 350ºF. Start by baking the jam. 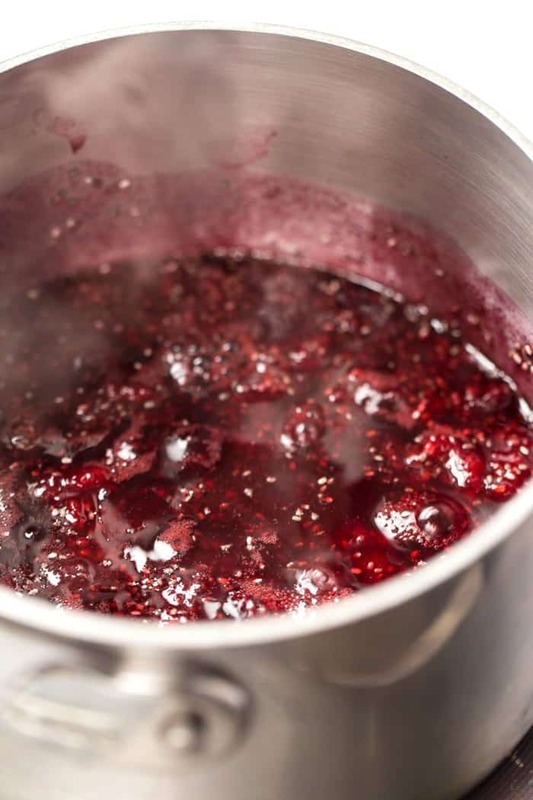 Add all the jam ingredients into a small saucepan and stir together. Bring to a low boil and continue to simmer for 10 - 15 minutes. Remove from heat and allow to cool for 15 - 20 minutes. While the jam is cooling, prepare the cookies. 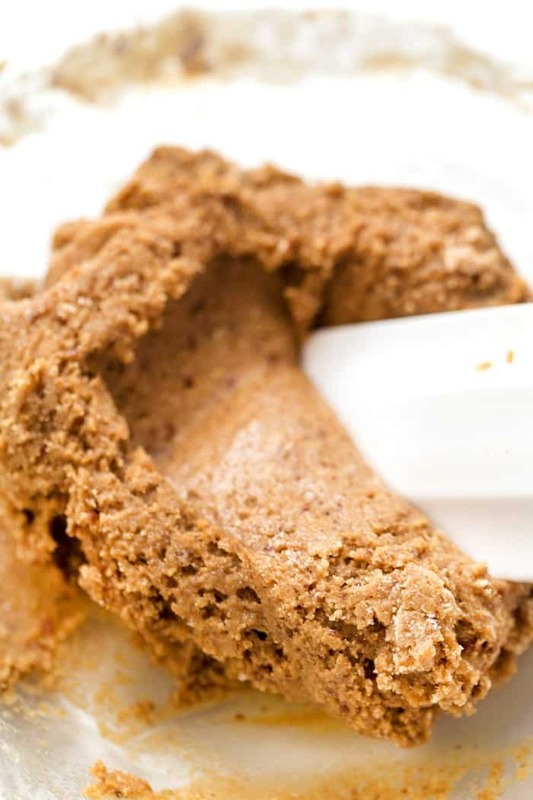 Beat together the cashew butter, flax egg, syrup and sugar until smooth and creamy. Add half the coconut flour, along with the vanilla and baking soda, and mix until combined. Beat in the remaining coconut flour. Scoop 1 tablespoon of dough into your hands and roll into balls. Place on a baking sheet and repeat until no dough remains. Use your thumb to make an indent in the center of each ball and bake for 9 - 10 minutes. Remove from the oven and allow to cool for 10 - 15 minutes. 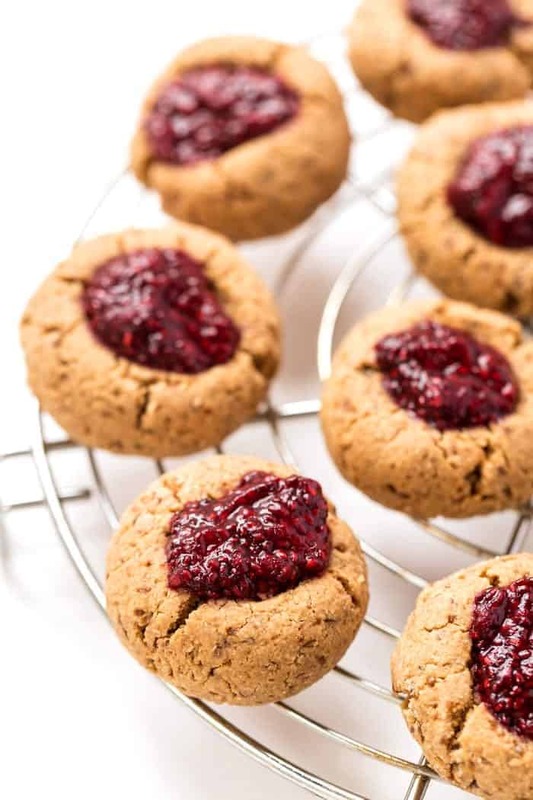 Once cooled, add 1 teaspoon of jam into the center of each cookie and serve immediately! Thanks for this recipe. I’ve been looking for coconut flour recipes! These cookies came our really well. They’re a little chewy – in a good way – and delicious with the jam. I used peanut butter instead of cashew and they were great. Hey! 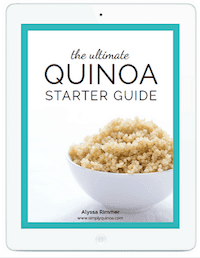 Could the coconut flour be substituted for something like quinoa or almond flour? Unfortunately, not without a complete overhaul of the recipe. Coconut flour is quite finicky and can’t be substituted 1:1 with any other flour! I’ve never made my own jam before. If she use this recipe to just make the jam potion can I double it and then just refrigerate it. Do I need to add something to the jam to keep it longer ? How long does the finished jam keep? You didn’t mention any water for the raspberry jam, should there be water added to cook them down? Also would there by any more or less when swapping out for strawberries since they have a high water content? Délicieuse cette recette merci 🙂 J’ai utiliser moitié beurre d’amande moitié tahini c’était parfait! I’m allergic to raspberry but would love to try making these! What might be a good substitute for the jam? Strawberries, blueberries? Any other berry would work! How long can these be stored? And should I store them in the fridge or at room temperature :)? I store them at room temp! It’s the BEST! You can also swap with another berry, no problem! 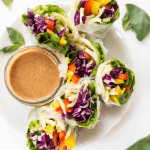 Do you think you could use tahini instead of cashew butter for nut free? Sunflower butter! Just be aware that sunflower seeds and baking soda have a strange reaction where they turn green! You might want to try using baking powder instead! Would vanilla in liquid form be okay instead of the vanilla powder?